Exactly. Doing it during construction is one thing. Between reuses it is a *whole* new ballgame. If its welded and they do not use removable fasteners, how will they de-weld the clam-shell? Doing so would be terribly inefficient. There is going to be so much wiring, pipes, and other interfaces that surround and connect the top part of the pressure vessel from the bottom part. Madness. Just see how complex the Orion systems are (a similar design), and they aren't even done installing everything needed for EFT-1. What makes me think that they will open the entire clamshell for access is Boeing's direct statement in the slide included in this post where they say "Clam Shell CM Design allows easy hardware integration"
Frankly, I was amazed to have it shown that Boeing can do this. I don't know why you would be amazed Boeing can do this. They are a major aerospace company. If their engineers think the clamshell concept is better than how Orion is setup, it's a matter of engineering to get it to work. The proof, of course, will be in testing. "The clamshell structure is weldless." Also CST doesn't have to use its LAS to get into orbit like DC does. I'm not sure I see how that's a drawback.. it seems like an efficiency to me. DC either aborts and uses the engines to do the abort, or doesn't abort and uses the engines to achieve orbit. CST-100 throws away perfectly good engines unless they are needed in the abort. Those engines, not being used much, are likely to be less reliable on average than engines that get used a lot. All IMHO anyway. CST-100 may have an Abort-to-Orbit mode, where if the second stage under-performs by a small amount the LAS fires and allows the mission to continue, whereas DC might be forced to deorbit under the same scenario. Those engines, not being used much, are likely to be less reliable on average than engines that get used a lot. I am responding in support of the remaining bulk of your post. It makes sense to me, too, to use the engines for two purposes that cannot overlap. Someone might object that giving them two tasks makes them less than optimum for either task, and maximizing their performance and reliability as a LAS is a standard goal. It doesn't have to be. OTOH as Boeing has pointed out, the propellant could be used for ISS reboost. Boeing has been consistent and particular in stating "propellant", so presumably the main LAS thrusters are inappropriate. There are quite a number of smaller LAS control thrusters on the SM that might be appropriate for the job? Not sure if using the CM RCS thrusters is feasible. A picture of some hardware on the NASA Commercial Crew Facebook page. HOUSTON, Feb. 13, 2014 -- Boeing's [NYSE: BA] Commercial Crew Program (CCP) recently completed a hardware design review and software safety test, bringing it closer to launching the Crew Space Transportation (CST)-100 spacecraft that will return Americans to space. 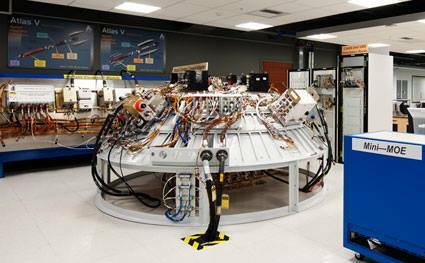 Boeing completed a Critical Design Review for the the system's Launch Vehicle Adapter (LVA), which connects CST-100 to the United Launch Alliance Atlas V rocket. The CDR, which included wind tunnel tests verifying flight stability, confirmed that the LVA design is suitable for production. Separately, the Atlas V rocket's emergency detection system, which communicates with the capsule and initiates emergency procedures, if needed, passed its evaluation. "Safety is a key element of the CST-100, from the drawing board to design implementation and beyond," said John Mulholland, vice president and program manager, Boeing Commercial Programs. "These tests help to validate that the launch vehicle adapter and emergency detection system are fully functioning and able to ensure a safe launch for our future passengers." These two milestones are part of NASA's Commercial Crew Integrated Capability (CCiCap) agreement with Boeing. Next in line for the program is a software review this spring and the more comprehensive Integrated CDR this summer. Boeing is on track to meet all 20 of its CCiCap milestones in 2014. Visit www.beyondearth.com for more information about the future of human space exploration. A unit of The Boeing Company, Boeing Defense, Space & Security is one of the world's largest defense, space and security businesses specializing in innovative and capabilities-driven customer solutions, and the world's largest and most versatile manufacturer of military aircraft. Headquartered in St. Louis, Boeing Defense, Space & Security is a $33 billion business with 58,000 employees worldwide. Follow us on Twitter: @BoeingDefense. "Boeing's [NYSE: BA] Commercial Crew Program (CCP) recently completed a hardware design review and software safety test, bringing it closer to launching the Crew Space Transportation (CST)-100 spacecraft that will return Americans to space." Always better to be assertive. I can't seem to find a caption or hi res version, but maybe it's hiding somewhere I can't find it. That is the Centaur Forward Adapter with avionics. Why not? They're in the lead. I suppose if they really complete the integrated CDR in a April, and the only remaining milestone for them is a spacecraft safety review, then they just might be in the lead. They are closer to completing all of their milestones than any other vendor. Ed is correct, regardless of what all the SpaceX fanbois may think. IMO: If and when down-select of CRS providers occurs to 1.5 competitors the 1.0 award will go to Boeing, with SpaceX getting the 0.5 award. I assume the relative positions haven't changed since the last selection statement, where Boeing was further along in design but SpaceX was willing to invest more. How those facts will be weighted in the CCtCap I couldn't say, especially because the program is starting to get more money, but regardless I think it's safe to assume that both vehicles will put Americans in space - just not necessarily govt employees.